The word “historic” is used quite a bit these days. And yet, the agreement reached between the Colombian government and the FARC is such an historic event, although we will have to wait most likely until 23 March 2016, until a final peace agreement is going to be signed. What happened? The government and the leftist guerrilla group reached an agreement inside the fourth point on the negotiation agenda, the victims chapter and decided to sign a final peace agreement in the next six months. It took 16 months to negotiate about issues related to how justice and reparations can be guaranteed to the victims of the armed conflict that has lasted already more than 50 years. The difficulty to find common ground is reflected in the long period of time it took the negotiating parties in La Habana, Cuba, because the first three items on the agenda (land issue, political participation and drugs) were resolved in overall 19 months. The Colombian public is split about the announcement, running along the deep divide in society about whether or not to have a negotiated peace agreement in the first place. While those who are in favor of negotiations were very excited about the news and welcomed the agreement, the camp critical of negotiations blamed Santos to “giving in” and “loosing out” to the “terrorists,” the FARC. In other words, the political parties from the center and the left welcomed the agreement while the political parties from the right attacked it (particularly Centro Democratico of ex-president Alvaro Uribe) and others were silent (including Cambio Radical that has the position as the vice-president inside the government of Santos). A model for the rest of the world? The agreement bridges the concern of the FARC to avoid prison by vaguely talking about confinement, a compromise that should serve for both sides. So far, it is still not clear what confinement exactly means and what conditions it will entail. The “most responsible” (basically those who committed crimes against humanity) who collaborate with the justice system will face charges of 5-8 years, while those who do not collaborate will go to jail for up to 20 years. While amnesty will be applied for most FARC members, there is a system of special jurisdiction going to be set up. These terms of the transitional justice model presented by the negotiation parties should be sufficient for the International Criminal Court to not intervene in Colombia, as it is often suggested by the far right, because there will be no blanket amnesty. By contrast, those who were solely involved in political crimes can receive amnesty (which would include the large majority of FARC members). This is a very similar system that was already used for the paramilitaries (more specifically the Autodefensas or AUC) in the transitional justice process embedded in the Justice & Peace Law (2005). By ensuring Colombians that FARC members will be confined, a demand that all opinion polls in Colombia underline, it should be much easier for president Juan Manuel Santos to convince his citizens that the referendum he promises to hold about the final peace agreement will be accepted. The agreement is very clear that not only FARC members but whoever was actively or indirectly involved in the armed conflict is facing the threat of confinement, including state actors. This point is, by its nature, highly controversial because for the far right (represented by ex-president Uribe and the Inspector General Alejandro Ordoñez), it should only be the FARC and not the armed forces that receive sentences. Last but not least, two observations about the psychology at play. The leader of the FARC, Rodrigo Londoño – widely known by his nom de guerre “Timoshenko” – was very softly spoken at the press conference; a very different man, as he is usually showing his tough side in public. The other observation is what happened at the handshake – which is unprecedented – at the end of the joint ceremony: Cuban president Raul Castro and Timoshenko had big smiles on their faces while president Juan Manual Santos seemed almost unable to show any sign of happiness. 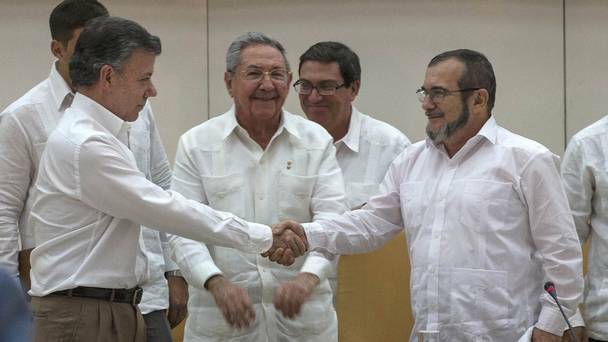 It is not clear why that is the case, but the FARC leader obviously seemed to be much happier than Santos. While the ELN (the second biggest guerrilla group in Colombia) was not mentioned a lot during the debates about the agreement, they should be also easily be included in the framework established for the FARC as they supposedly start their negotiations in October in Ecuador. 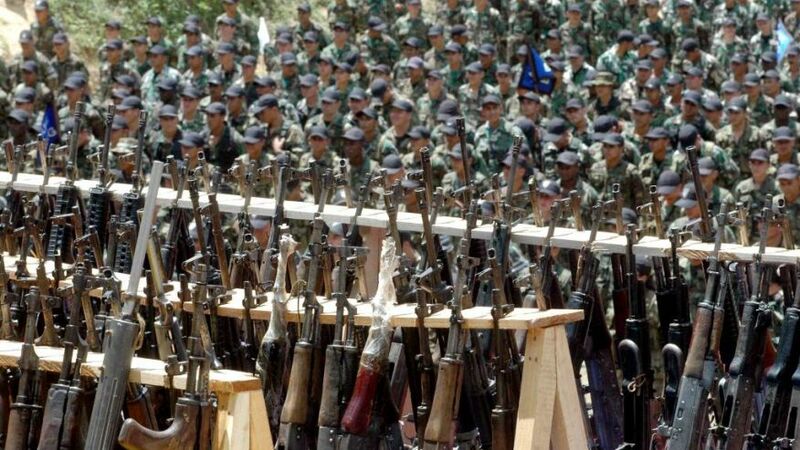 Therefore, the ground is set for an end of the violence with many more illegal armed actors in Colombia. It is no surprise that the agreement is called “historic” and indeed it was the most important step forward toward a negotiated peace agreement. 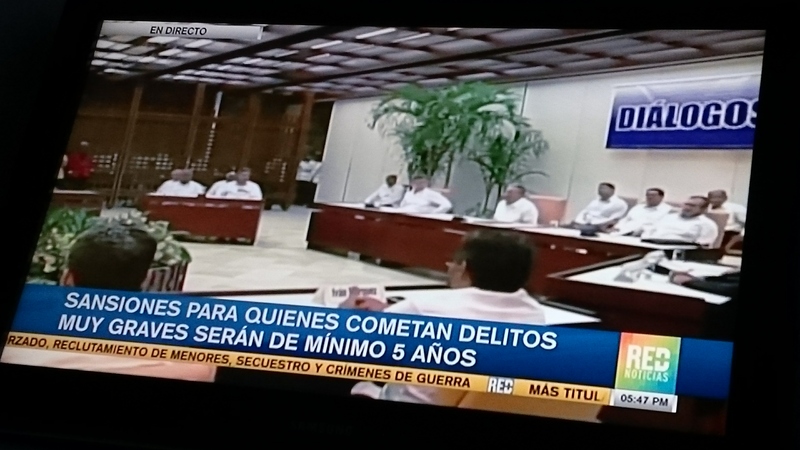 Edit on 26 September 2015: Alejandro Ordoñez is not the Attorney General but the Inspector General of Colombia.